Partly or highly conserved prolines (>5% of the sequences) can be found in TMH1 (positions 1.36 and 1.48). TMH2 (2.58, 2.59. and 2.60). TMH4 (4.59 and 4.60). TMH5 (highly conserved 5.50). TMH6 (highly conserved at position 6.50 and occasionally at 6.59). and TMH7 (7.38. 7.45. 7.46. and 7.50). Table 3 also shows the probability of finding a Ser or Thr residue in the direct vicinity of the Pro. Although 52% of the Pro-containing TMHs contain either Ser or Thr in the vicinity of the proline, its distribution is not uniform over the different Pro-kinks. Fig. 3. 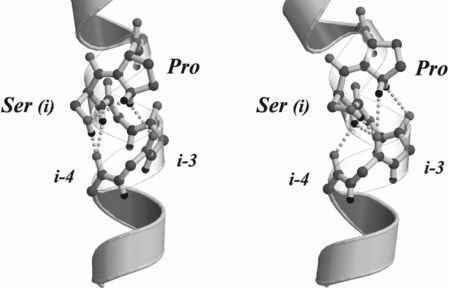 Influence of the side-chain conformation of Ser in the geometry of an a-helix featuring a Ser-X-Pro motif. The local hydrogen bond network in the helical turn (yellow dots) is different when Ser is in gauche+ (left panel) or gauche- (right panel). 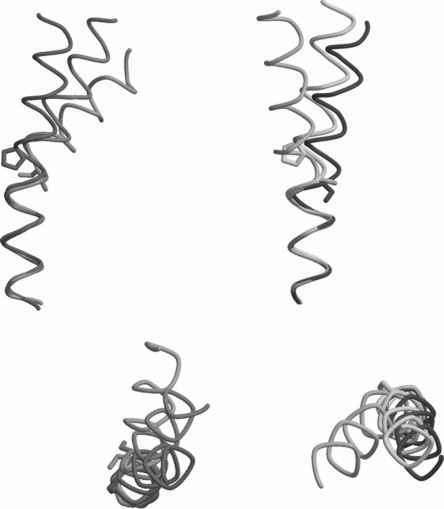 These local changes induce or stabilize strong distortions of the overall helical structure. specific interactions of their polar side-chains. These significant conforma-tional changes may have important functional roles, such as modifying the three-dimensional arrangements of the receptor's binding site crevice, what we refer to as "plasticity" of the binding site. These conformational variations within the binding sites, which allow or prevent specific interactions to take place, may be responsible for divergent recognition of different ligands through evolution. Therefore, combinations of Ser and Thr residues with Pro appear as a likely mechanism for structural adaptation of membrane proteins through evolution. Fig. 4. The left panels display two different views of representative structures of a-helices featuring a Ser-Pro motif, with Ser in the gauche+ rotamer (red), and in the gauche- rotamer interacting with two different backbone carbonyls (dark orange and light orange). The right panels show helices with a Ser-Ala-Pro motif in the gauche+ (dark green), trans- (yellow), and gauche- rotamers (light green) of Ser. Variation in the side-chain rotamer or the hydrogen bond pattern covers a wide structural range in the a-helix. ces of soluble proteins (where they are thought to destabilize this secondary structure), they are much more common in TMHs. The reason may be the lack (or decreased presence) of water molecules within transmembrane domains. The P-methyl group that is absent in Gly residues that is present in all other side-chains shields the carbonyl of the preceding turn from potential hydrogen bonding partners such as water molecules. Therefore, it might be possible that Gly residues in TMHs do not destabilize a-helices and can thus be used more often to confer the desired structural and/or functional roles. For example, the crystal structures of bovine rhodopsin show a strong bend in TMH2 at the level of Gly892.56 and Gly902.57, stabilized in part by Thr residues in the next turn hydrogen bonding their preceding carbonyls as described earlier (48). Interestingly, Gly residues are also often found near transmembrane Pro residues, increasing the local flexibility of Pro-kinked a-helices (24,49). 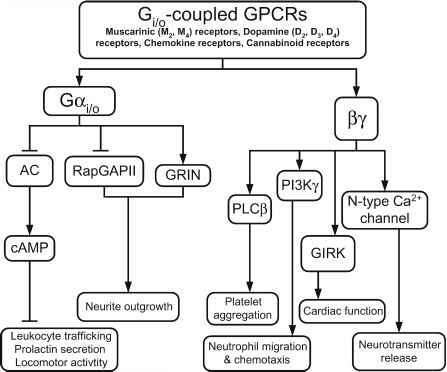 In fact, a Gly-Pro motif has been proposed to be responsible for the divergent agonist recognition between the cannabinoid (CB)2 (Phe-Pro) and CB1 receptors (Gly-Pro) (50). Finally, Cys residues contain a sulfhydryl group in their side-chain that is also able to establish an hydrogen bond with the backbone carbonyl of the a-helix (43). Although this weak hydrogen bond can not promote a structural distortion in the helix on its own (44), it is likely that similarly to Ser and Thr, its presence synergistically influences the effect of nearby Pro (51) or polar residues (52), leading to substantial conformational changes in TMHs. This would explain the conservation of several Cysteine (Cys) residues within GPCRs, such as the conserved Cys6.47 that recently has been shown to modulate the Pro-kink of TMH6 in the P2-adrenergic receptor (AR) (51). It has been proposed that this Cys unusually hydrogen bonds its own carbonyl in the inactive state of the receptor in the trans-rotamer configuration, thereby exploiting the flexibility of the Pro-kink motif, whereas it hydrogen bonds the backbone carbonyl of the fourth preceding residues (like Ser or Thr residues) in the active state (51).